Philipp Niemeyer, PhD candidate at DLR, won the poster award on the Third International Seminar on Aerogels on 23 September 2016. 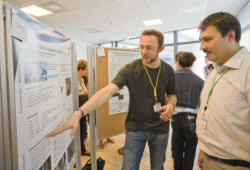 His research at the Institute of Materials Research at DLR in Cologne is part of the NanoHybrids project. Philipp spoke to the NanoHybrids press team.